To centralise or not to centralise – is it really a question you should be asking yourself or do you know the answer already? We guess we don’t have to remind you that you can be busy without really being productive. It’s a human problem you’re trying to solve and the solution lies in having a centralised platform that marketers can use without having to duct tape many different solutions together. 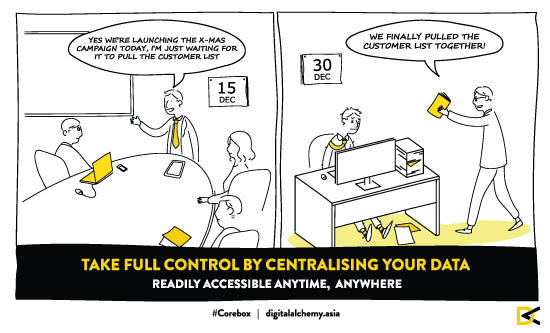 Corebox is exactly that and more – a centralised platform as the solid foundation for the marketing automation of your campaigns. Many marketing automation implementations fail because of poor database design. Developed by marketers for marketers, Corebox comes with a marketing database that supports marketing strategy, analysis, and automation. With Corebox you have the right customer data available and accessible at any time and you can easily run and measure your marketing campaigns yourself. This means better collaboration across departments, improved marketing and sales alignment, and never missing that Christmas campaign deadline again.